I feel as though someone is holding my heart in their clenched fist. When I've tried to explain this book to people, all I can say, dumbly, is "it's about four friends". In essence, this isn't the case at all; the book is about Jude and his three friends who loved him immeasurably. It's about Jude's shadowy past, about how he struggles, and how his friends try to show him he's loved across the majority of all of their lives. A beautiful friendship enduring decades, the loyalty, and the talent of all these men, had me brimming over with love. Then there was the abuse, the injuries, the self-loathing, and the utter heartbreak of someone unable to see their own worth, each of these facets bending shadows and light into one another like hallucinations. Jude's story is gut-wrenching, utterly harrowing, and is told in stark, unforgiving prose that spares absolutely no detail of the cruelty; hammering us time and time again with more incidents, more sadness, more abject sin. That Jude's past sufferings could not and would not leave him, that his guilt and horror for these hindered even the most simple pleasures in life, that his chances at happiness were snatched away from him was a build-up of pressure that my senses couldn't bear to withstand. Yanagihara's skill here is unquestionable; writing without romanticism and without absolution is brave, utterly original, and (I quite honestly feel this) somewhat heroic. Yanagihara's characterisation is utterly flawless, and the story wouldn't be anywhere near as impactful without it. She makes us fall in love with four friends, helps us understand their pasts, their motivations, their relationships, and their needs. She gives us secondary characters with such amazing depth that we fall in love with them too. She makes them our friends, and we're in this horrible journey with them until the end, unable to let go. The story itself is incredibly difficult to read, but the book is never difficult to pick up. No matter how grim, no matter how heartbreaking, the mastery of Yanagihara's writing will motivate you to read on. It's not lyrical, it's not flowery pretentious wordiness; it's raw, it's honest, and it's clean. She layers, she hints, she foreshadows, she bends time. It truly was expertly executed. Sometimes I wonder if thoroughly loving a book involves hating it just as much. I couldn't recommend this to anyone unless I knew they had the strength, the staying power, and the heart to take it. It's a bleak, profound, and important commentary on humanity and its power. 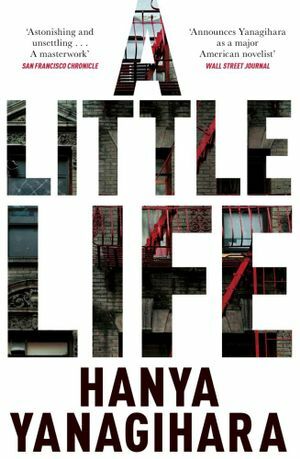 It's 700 pages of love and pain, and in itself, quite sincerely, a little life.